Something new is happening in Bay Area news circles: blogging criminal trials. Now, in addition to reporting a daily story on an interesting (read: juicy) criminal trial, the reporters are now doing a full out total transcript blog as well. I got hooked into following the Hans Reiser trials. You techno folks might recognize him since he’s the founder of the Namesys computer company and the designer of some file system software for Linux-based systems. Hans got himself a Russian mail order bride and has been accused of killing her even though her body was never found, no murder weapon was ever found, and only the smallest amount of blood was discovered. The prosecution’s case was built totally on circumstantial evidence – that in itself made it juicy, but it really got good when Hans got on the stand. This guy is so into himself. He kept arguing with the prosecutor, the judge, his own lawyer, and eventually the frustrated judge said: "You are rude. You are arrogant. There's not enough words in the English language to describe the way you are. You have been trying to make a mockery of these proceedings." And I think he said that to Hans in front of the jury. The blog was fascinating to read. So much more detail than could be devoted to the story in the print edition, or even in the online edition of the SF Chron. I ended up corresponding with the reporter, a UCB alum. Reiser was just found guilty yesterday. Check the picture of Hans. 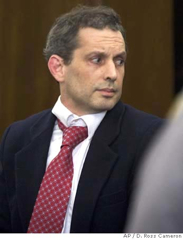 He’s such the computer geek that he couldn’t even get his shirt collar right as he faced the jury for the verdict. The blog is at www.sfgate.com if you are interested. Okay, I think I should bring this up now... especially since no one posted on 4/20. Okay, so the next time you're eating think about how amazing it is that your tongue can generally get out of the way when you're eating! If you think about it, it is kinda trippy that, most of the time, we don't bite our tongue. It takes up most of the space in our mouths, and yet, it is able to get out of the way of our teeth when we are chomping on food! How amazing! Yah, okay, one mouth! Grammar is difficult in this section--ya gotta just go for it!